Christmas is a fun time for kids. 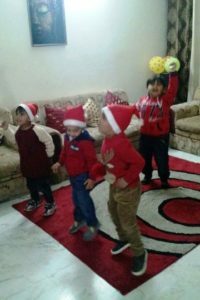 The fun gets doubled when all kids get together for the celebrations. 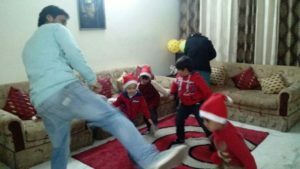 This year, my friend hosted a Christmas Party for Kids at her place. 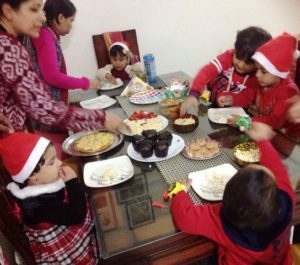 She had arranged some really fun activities and games for the kids as well as some awesome food for their tummies. Here is a glimpse of the fun that we had at the party. p.s. sorry for not taking great pictures… managing the kids was a really full time task. 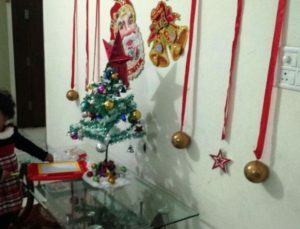 First of all, there was a little Christmas tree, with a nicely decorated background. Also, the living room had numerous white and red balloons, for the kids to have fun with. 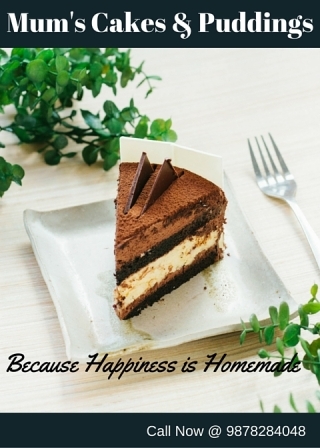 The menu was simple, yet yummy and filling. 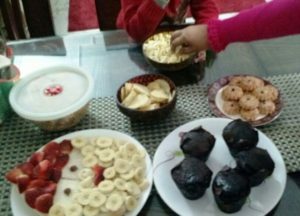 There were Chips, Popcorn, Cookies and Muffins for snacks. Further, for the main course, we had homemade Pizza, Vegetable Pasta and Vegetable Mayonnaise Sandwiches. Inspired from the Facebook posts, we tried making a Santa face with fruits, as you can see in the pic above. 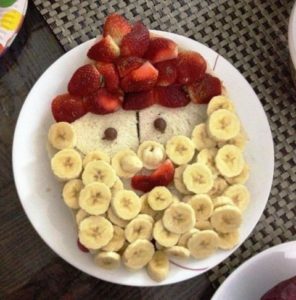 We placed all the sandwiches in a plate and topped them with sliced strawberries and bananas, in a way that it looked like a Santa face. 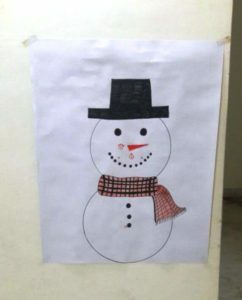 She made a snowman on a chart paper, except for the nose. From an orange colored chart sheet, she had cut out the triangular nose. We blindfolded the kids and they were supposed to place the nose at its right place. The kid who placed the nose nearest to its right place, won the game. All the kids were really excited to place the nose ! 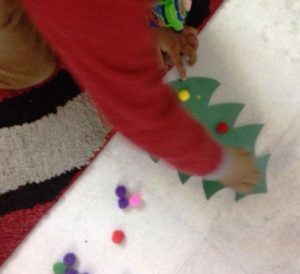 We cut out mini Christmas Trees from Green Chart Paper and gave one to each kid. 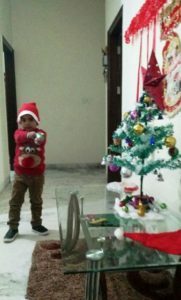 In addition to it, we gave the kids some stickers and pompoms alongwith glue, to decorate the trees. There was a kid who had to leave a little early, so we gave him the cutout and decoration material to take home. Seems like, this activity can be a good party favor idea too! My friend’s son has recently started taking dance classes, and she had arranged for the dance teacher to take a session with the kids. Everybody had a gala time dancing on their favorite bollywood numbers. Later, we also joined in the dancing fun. Finally, the time came when Santa paid a visit to the kids. He came with a loud “HO HO HO!” and carried a bag full of goodies for the kids. 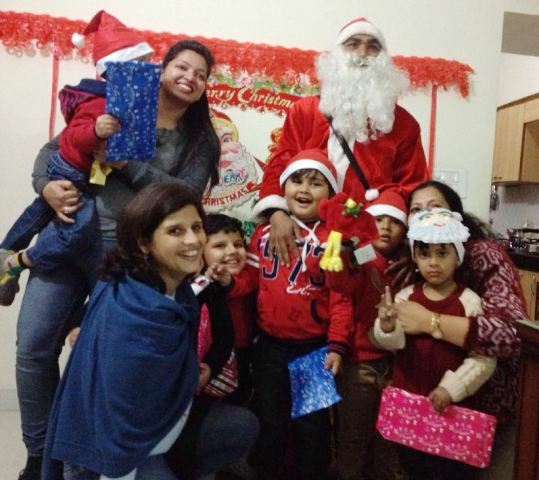 A Santa was arranged for the same and the kids were delighted to meet him and receive the gifts!!! 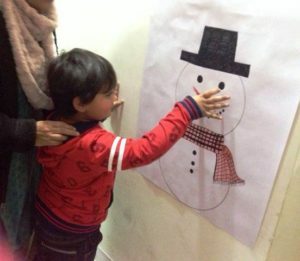 In conclusion, the party was full of fun and created lovely memories for the children!